I'd rather support my local nursery, but they would look at me like I was crazy if I brought any plants back after a month or two. So Home Depot and Lowe's are still my best sources of succulents. Of the two, Home Depot has the best selection in my area. Almost all the plant friends are doing fine. As it was pouring this morning, Sweet Hubby went out and put a tarp over the succulents out in the kitchen courtyard, since I mentioned I was concerned they were not getting any time to dry out. I was still in bed. Sweet man. The pot above is under cover and I'm experimenting to see if the ones in the yard can take the excessive rain that we sometimes get in the summer. This one which I can totally control the amount of water is of course doing very well. The picture above shows the inside so you can pretty much tell what whole this looked like before. There was once 2 of these cheapy, cheap plastic urns sitting out by the shed or in it for a while now. One has gone missing, so no telling if was long smashed with the winds of change. They have served to hold pumpkins, small Christmas trees inside and outside, topiaries and many flowers and plants over the years. They had long paid off buying them for whatever in the meantime reason they were purchased for. So the one that was left was perfect for my little experiment. Many years ago I painted terracotta pots with outdoor paints and they actually held up very well. One of them is still right outside the kitchen door with its new seasonal flowers. Its mate got broken over the years, and I never did get around to making another one. This time I wanted a "cement" look. So I was off to the store to buy some cement to mix with my paints, but I didn't think they sold really small bags of cement, and I certainly didn't need a larger bag sitting around until the contents got hard and had to be tossed in the garbage. Keeping anything out of the landfill is the main reason I tried to do something with this ugly ol' plastic urn. Instead I started brainstorming other things that we might have used for some project that was cement based. Ah yes... grout! 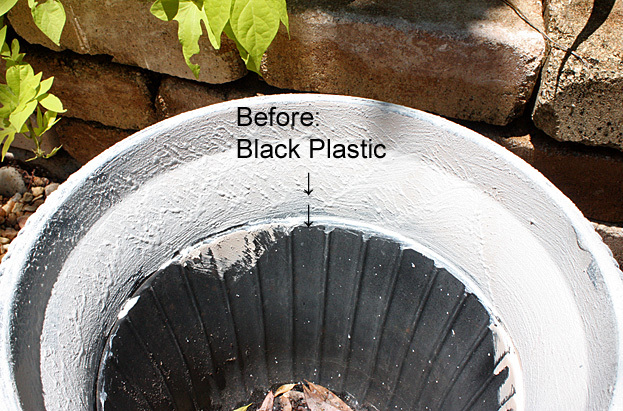 So I poured some off white grout in a container, adding some chalk paint just because it is supposed to be able to withstand the outdoors, and some flat exterior white paint, and then tiny bits of black paint until it was tinted gray. I used about 3 shades of gray cement paint that I mixed as I went along, and 2 shades of whites. 2. (Keep some of the paint from each time you do the next steps.) Very slowly add small amounts of black paint. Very small amounts each time as needed for the color of cement gray you want. 3. Now you have 3 or 4 containers of various shades of gray, light to the darkest (which is the one you added the most black to) so you can add dept like concrete has. You will use all of the different shades of gray to get the look so you can make up shades as you go. 4. 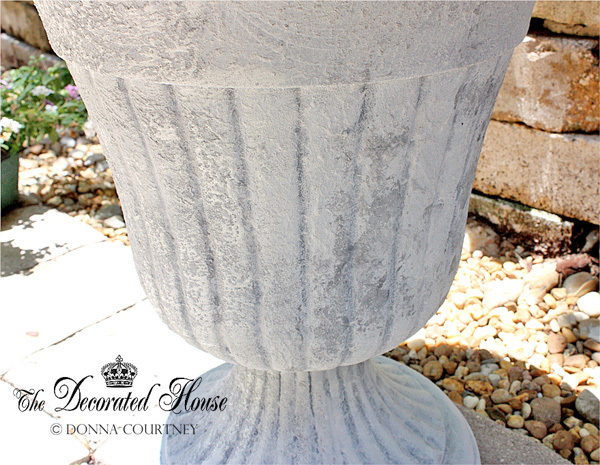 Using an old paint brush, or a cheap chip brush go over the deeper areas or crevices with the darkest gray first. 5. Alternate between your different grays, painting, slapping, rubbing - whatever technique makes you happy with the results you are getting for a faux cement look. 6. Finish by dry brushing 2 or 3 shades of the lightest original flat white and grout paint on top. I used an old brush so I could just smack and stipple some of the thick paint mixture on. I used an old cement paver to get the feeling of the textures and color variations. I went over the crevices once with a darker gray and then dry brushed back over the whole thing with a light gray to white cement paint mix. It dries very quickly so you can get it done and ready to use in a day. 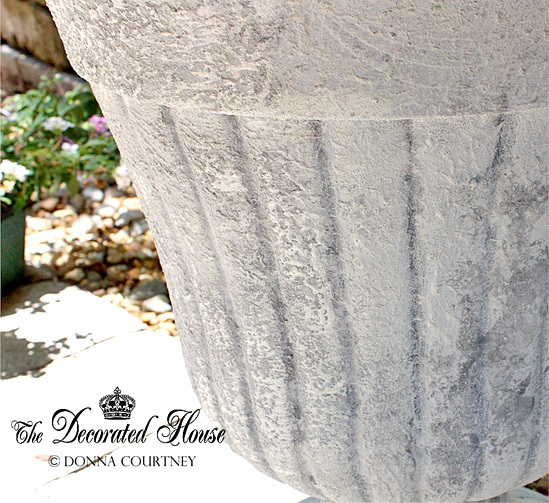 Depending how the type of paint you use and it's weathering ability, you may wish to put a protective coat of finish on your pot. Since cement has a very flat finish, to look like cement, you would want to use flat or matte finish paints and final coat. Love the updated urn! Great idea. It turned out beautiful, Donna! I love your succulents, too. 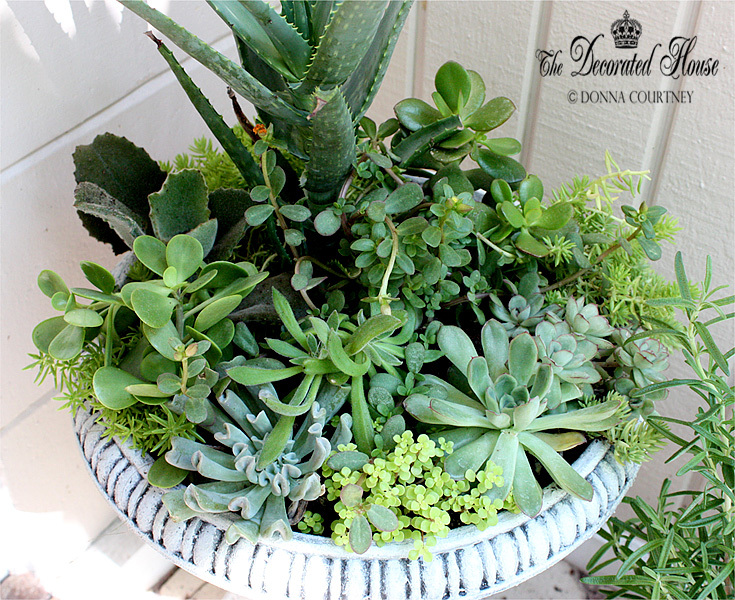 I never would have thought to put a grouping of them in an urn planter, but it looks great. Looks great...like the real thing! You are very creative and resourceful. What I love is that it cost nothing, I have a new garden pot for the succulents to see how they enjoy plastic versus terracotta, and I didn't have to toss out an old ugly plastic urn/pot which would end up in a landfill. I'm sure it will get many more years of use now. This turned out great! I love succulents. Saving this great idea for future reference. Thanks for sharing. You have the best tutorials! Loved the turquoise patina one and so did my facebook followers! Hate those plastic pots...but love the weight of them!!! I hope you give this one a try. I so agree with you all, love succulents but do not love those ugly plastic pots. However they are so convenient because of they are so light and easy to move around. Hey Donna will that not chip of the plastic Urn ? If I were thinking about it now, I'd say it would be a good idea to maybe prime it or at least rough it up a bit. Which still isn't a bad idea. But I did this a year and half ago now, and not one single spot has chipped. It is on a covered porch. However I have a pot sitting outside for several years that I used exterior spackling on a terra cotta pot and it has not chipped either.